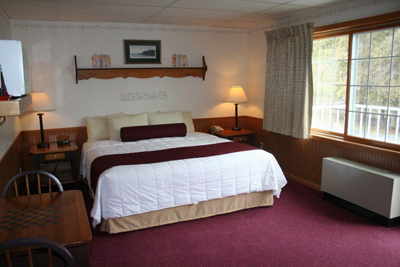 Ephraim Shores Resort is located in the picturesque town of Ephraim. Family built and owned since 1969, kid-friendly Ephraim Shores offers a wide variety of accommodations, some with a terrific water view, and at reasonable rates. Great place! Wonderful indoor pool with large hot tub area, a game room off pool area, small exercise room. Complete! Located in sparkling Eagle Harbor, Ephraim Shores is right across the road from wonderful wa ter and Peninsula State Park views. With decks or patios, a wonderful indoor swimming pool, whirlpool/hot tub, flower garden, cable TV and even bikes available to their guests, Ephraim Shores is a truly what they say on their literature: “relaxed lodging with a view.” And free Wi-Fi too. We met with the property manager, and toured the motel, looking at sample rooms and accommodations in various configurations. The lobby area, right across from the water, is cozy and inviting, and the staff behind the desk courteous and caring. The pool area is awesome, with a large hot tub area, a game room off the pool area that even has a pool table, and a small exercise room off the game room. Complete! The main hallway on the main floor is loaded with Door County art, and some historical photographs of the town of Ephraim – some are just wonderful representations of life in the early 1900’s – take some time to take a look. As we headed upstairs, we noted nice touches like a reading area with a glider rocker, books, lamp and nautical map. The hallways and common areas are all neat, bright, cheery and clean.The king bed faced a flatscreenTV/Dresser combination unit. The window overlooked the parking lot. Two coordinated recliners, and a small game table and chairs completed the room. Again, nice touches like stenciling along the ceiling border and on the walls, makes the room cozy and inviting. This room has a nice bath area with tub/shower and separate sink area, small refrigerator, microwave, coffeemaker and plenty of closet space behind the mirrored closet doors. This is a room with a view! Two queen beds and one heck of a view of beautiful Eagle Harbor (trees, water, sky and the edge of Peninsula State Park across the waters) make this one special room! Same small appliances as before (coffee maker, etc)., flatscreen TV and charging station, and a nice bathroom with tub/shower combo all add to the desirability of selecting this room (or one just like it)! The view is awesome. Still upstairs, we toured another gorgeous view room! With a king bed and a recliner, flatscreen TV and charging station, this room offers a lot. But wait – there is more! The “headboard” of the bed (attached to the wall) is an oak mantel, with matching trim to frame the headboard – unusual and nice. Want a whirlpool for 2? This is your room. 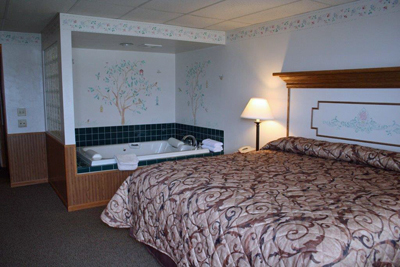 There is a nook with a double whirlpool, with one wall glass blocks – this offers a wonderful respite after a long day of Door County activities! 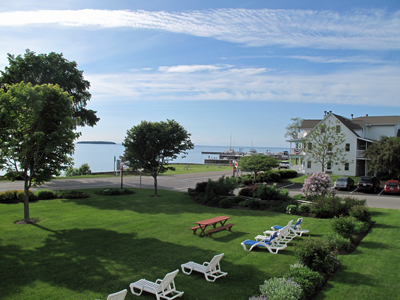 Or step out onto the balcony, have a seat, and absorb the wonderful view of shimmering Eagle Harbor waters, trees, Peninsula State Park and more – ahhh! 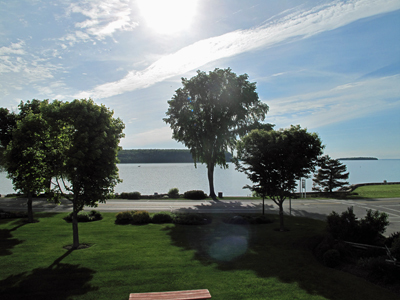 This is simply the best – hard to beat a view like this anywhere in Door County. Another nice room, with a view overlooking the lawn, and a partial water view. If you are looking for a more economical room, this room with a queen bed and standard small appliances as before may be what you are looking for. We then took a look at the colorful and well-maintained garden, along the south end of the property. Some rooms afford this tranquil garden view, so ask if you are interested. In the garden area is also a play area for kids with a swing and slide gym set. Ephraim Shores offers a wide variety of accommodations, and even offers a one bedroom and a two-bedroom suite. This is a totally smoke-free environment, which offers a lot of amenities beyond what we mentioned above like kitchen and laundry facilities, bikes, a waterfront beach/sundeck area and more. We enjoyed our tour, and found the folks at the front desk a delight! You might see JoLynn, Jan or Lana there – say hello for us and tell them you found them on DoorCountyNavigator.com! Below are some additional views from some rooms and more!